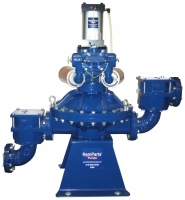 The rugged construction and extra-thick casing of RamParts air-driven diaphragm pumps stand up to the abuses of the most demanding sludge and slurry applications. They overcome the "high-wear" problem commonly found in double diaphragm and progressive cavity pumps. Air-driven diaphragm pumps are capable of operating dry on suction lifts up to 20 feet and handling liquids with solids contents up to approximately 70%. Depending on the pump model, they will pass up to 3" diameter spherical solids. (Solids size determined by check valve type). Pump stroke rate, discharge stroke time, suction drive pressure and discharge drive pressure can all be adjusted independently. Pumps will easily handle heavy sludges at their rate of accumulation in clarifiers and settling basins. We are an authorized distributor for Arizona.